Streaming platforms are increasingly popular, but if you want to watch 4K HDR movies with the absolute best video and audio quality, 4K Ultra HD Blu-ray playback is the way to go. And thankfully, there are plenty of great Ultra HD Blu-ray player options on the market. Note: All listed prices reflect current Amazon discounts at press time and do not include taxes or shipping. Samsung UBD-M7500 4K Ultra HD Blu-ray Player ($117.99) - Samsung's current entry-level 4K Blu-ray player offers Ultra HD Blu-ray disc playback with support for HDR10 (but not Dolby Vision). Likewise, an HDR10+ firmware update was announced earlier this year, though the company has not yet released it. An HDMI video out, optical audio out, USB connection, and an Ethernet port are integrated as well, but unlike some other step-up models this unit does not offer a dedicated HDMI out for audio or Wi-Fi capabilities. LG UBK80 4K Ultra-HD Blu-ray Player ($126.99) - Another basic yet perfectly serviceable 4K Blu-ray player, the LG UBK80 includes support for Ultra HD Blu-ray disc playback and HDR10 (but not Dolby Vision). An HDMI video out, optical audio out, USB connection, and an Ethernet port are integrated as well, but again, unlike some other step-up models on this list, this player does not offer a dedicated HDMI out for audio or Wi-Fi capabilities. LG UBK90 4K Ultra-HD Blu-ray Player ($146.99) - LG's step-up 4K Ultra HD Blu-ray player for 2018 is one of the most affordable models on the market with HDR10 and Dolby Vision support. Likewise, the company has apparently corrected some troublesome disc drive noise issues that some users experienced on last year's model. In addition, the player offers two HDMI outs (one for dedicated audio), an optical audio out, USB, an Ethernet port, and Wi-Fi connectivity -- though app support is limited to just Netflix and YouTube. Philips BDP7502 4K Ultra HD Blu-ray Player ($146.99) - This Philips branded 4K Blu-ray player also includes Ultra HD Blu-ray disc playback with Dolby Vision support. In addition, the unit supports standard HDR10, and comes equipped with two HDMI outs (one for dedicated audio), an optical audio out, USB, an Ethernet port, and Wi-Fi connectivity with limited app access to Netflix and YouTube. Sony UBP-X700 4K Ultra HD Blu-ray Player ($148) - Sony's latest 4K Ultra HD Blu-ray player offers 4K disc playback with Dolby Vision and HDR10 capabilities for a surprisingly affordable price. In addition, the device includes two HDMI outs (one for dedicated audio), a digital coaxial audio out, USB, an Ethernet port, and Wi-Fi connectivity with access to a modest app library. Samsung UBD-M9500 4K Ultra HD Blu-ray Player ($197.99) - Though it does not include Dolby Vision playback like the above models in this section, The M9500 does offer HDR10 playback and is set to receive HDR10+ support via a future firmware update. Likewise, the player features two HDMI outs (one for dedicated audio), an optical audio out, USB, an Ethernet port, and Wi-Fi connectivity for access to the Samsung SmartHub app selection. In addition, the player supports 360-degree content playback and can even wirelessly stream Blu-rays to a mobile device. Microsoft Xbox One X ($399) - In addition to featuring Ultra HD Blu-ray disc playback, the Xbox One X also happens to be one of the most powerful gaming consoles on the market -- offering a killer combo for home theater fans who want a 4K player and a video game system. Though disc playback is currently limited to HDR10, the device does offer Dolby Vision support for Netflix streaming. Likewise, the unit includes full 4K HDR gaming support and a 1TB hard drive. 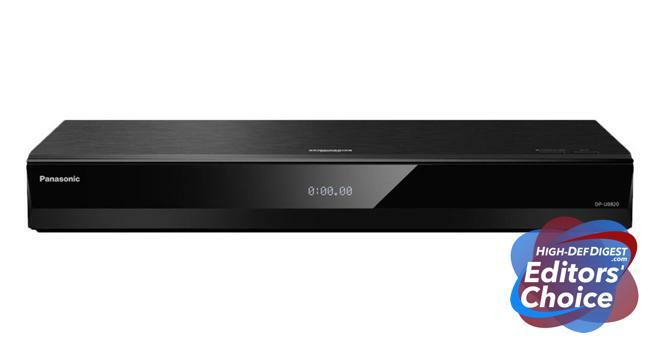 Panasonic DP-UB820 4K Ultra HD Blu-ray Player ($499.98) - As the only Ultra HD Blu-ray player currently on the market with support for HDR10, Dolby Vision, and HDR10+, the DP-UB820 offers industry-leading format capabilities. Likewise, the unit offers premium image processing, HDR optimization features, and advanced audio capabilities with a 192-kHz/32-bit 4-DAC. Two HDMI outs (one for dedicated audio), an optical audio out, 7.1 Channel Analog audio out, USB, an Ethernet port, and Wi-Fi connectivity are integrated as well. So, there you have it. Those are current top choices for 4K Ultra HD Blu-ray players in every budget category. What do you think about our selection? Do you have any other sound bar suggestions for each price tier? Let us know in the forums!